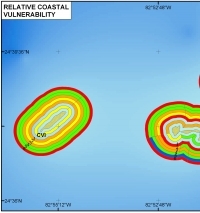 Relative Coastal Vulnerability for Dry Tortugas National Park. Click on figure for larger image. 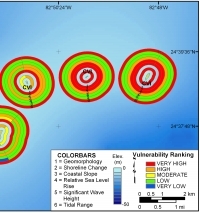 or view the USGS online fact sheet for this project in PDF format at http://pubs.usgs.gov/fs/fs095-02/. To visit Dry Tortugas National Park Web site go to http://www.nps.gov/drto/index.htm. To view files in PDF format, download free copy of Adobe Reader. Any use of trade names is for descriptive purposes only and does not imply endorsement by the U.S. Government.